State Superintendent Tom Torlakson says 174 California schools on "financial brink." (CNN) -- California's schools are in a state of financial emergency, according to the state's education chief, Tom Torlakson. The State Superintendent of Public Instruction spoke to reporters about the challenges facing California's schools at a press conference in Sacramento Thursday, surrounded by officials from numerous education-oriented groups and agencies. "The law won't let me call out the National Guard," he said. "So I'm saying to every Californian: 'Your schools need your help. And they need it now.'" Torlakson said that $18 billion dollars in cuts over the last three years have taken a heavy toll on the state's schools. He said that a California Department of Education survey conducted last year found that 58% of school districts have cut educational material; 48% have cut nursing and counseling staff; and 35% have increased class size while reducing the number of teachers. 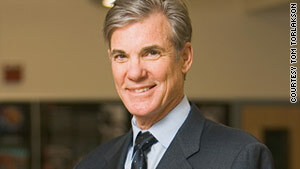 Nearly half of the state's districts are have reduced employee pay, according to Torlakson. He said that 174 school districts around California are "teetering on the financial brink." Torlakson said he's ordered a department-wide review, in order to set priorities and find ways to lessen what he called the "burden" of state requirements on on the districts. He also discussed plans to streamline school construction, help school districts learn from one another, and expand free and online resources for education.